Bioware commissioned special art for N7 day and you can get it, well a lithograph. 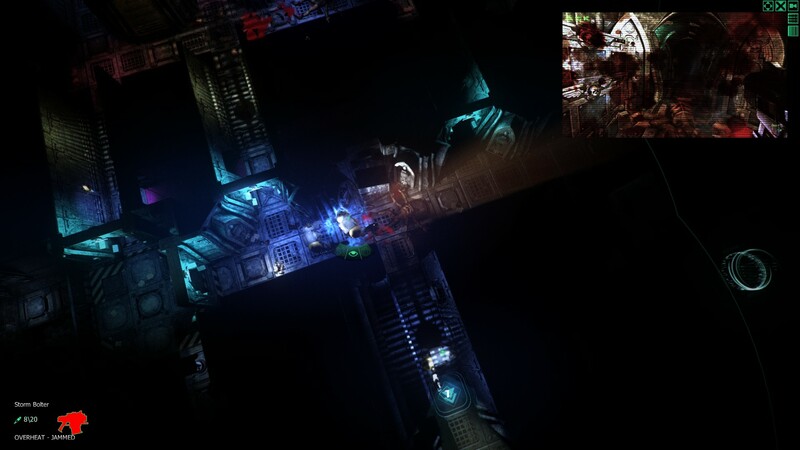 Space Hulk Ascension Edition Review – Squad Broken? I really wanted to like this. The Original Space Hulk had potential but received a bum deal from critics. However this game does not do enough to fix the problems. The Emperor weeps. Warhammer 40,000 sometimes gets a bum deal with its video games: the constraints of being a tabletop game with a massive universe have made genre translation a tough matter for developers. For every excellent game like Dawn of War, or even fun but flawed games like Space Marine and Dawn of War II, you have a glut of licensed fare that’s at best a generic trot through GrimDark locales (Fire Warrior) and at worst outright insufferable (Kill Team, Storm of Vengeance). Space Hulk: Ascension finds itself in a strange position, having been a board game long before it was folded into the Warhammer universe. 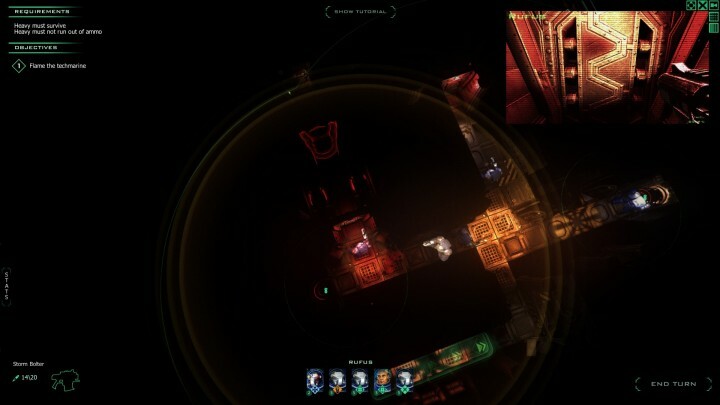 In the board game, a small group of Space Marine Terminators enter derelict spaceships to rescue someone, close open bay doors or activate some sort of machinery, and Ascension continues this tradition: there are a lot of closing door missions in the campaign. Ascension tries to spice up the action of the original with the inclusion of the Ultramarines, who specialise in ranged combat, and the Space Wolves, who specialise in punching Genestealers in the face until all that remains is a pool of viscous red liquid. These additions aside, the gameplay adheres closely to the board game, a two player game which pitted the bulk and power of the Terminators against the fast, dangerous Tyranid Genestealers. 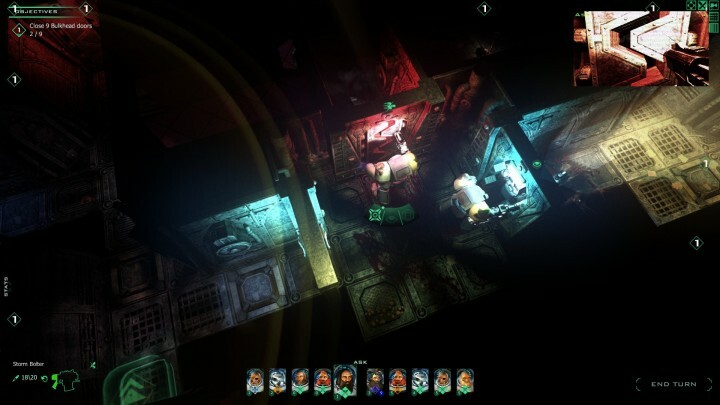 Much of the Space Hulk: Ascension takes place in dank, claustrophobic corridors, pitting at most 10 Terminators against as many Genestealers as the random number generator will allow. Space Hulk was a slow, ponderous game, balancing the safety of numbers with the ability to use the arms of your Terminators, with different approaches needed for different missions, and Space Hulk: Ascension is no different. The gameplay of Space Hulk: Ascension, then, tilts between being a tense, gripping claustrophobic tactical game and very slow and plodding. Part of the problem is that the board game it emulates is an asymmetrical battle between two players, which doesn’t translate well to a single-player experience as it misses out on the backstabbing and evil cunning from the game. Unlike, say, X:COM Enemy Unknown and Xenonauts, you have small environments and less freedom to customise, reducing the game to a corridor shooter without the shooting and a two player game without the over player. In Ascension, one invariably ends up using some variation of using overwatch to ready oneself, fearing that time when the random number generator decides you did not in fact hit that Genestealer at point blank range, blocking visible spawn locations for the Genestealers and cursing every time you pass an air vent. 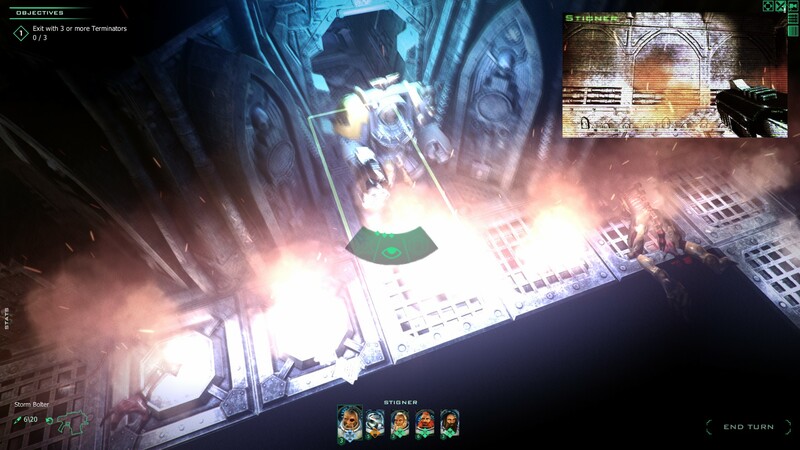 The missions, unlike the mostly free semi-randomised missions seen in Space Hulk, are pre-determined. The only thing really added to them is a very loose, text-only story for each mission and some RPG mechanics. I use Bolter fire and punches to open my doors too, of course. Graphically, the game is functional, with the Terminators being nicely rendered. There’s an interesting use of lighting, with the entire map starting out dark but slowly coming into view as you enter different rooms, another nod to the board game. Much like the vanilla Space Hulk, Ascension spices up the action with a camera providing a first person take on the action. This can be useful for picking out a Genestealer in the dark, but is mostly an aesthetic choice, particularly for the entirely cosmetic thermal imaging mode. The slow movement of the characters was a massive issue before, although mercifully this has been fixed with a “Fast” movement speed. Similarly, there is no music, but a lot of haunting, echoing noises, keeping you at your wits end, although that said it might have been nice to have some kind of industrial music at times. The RPG aspects could have been very cool in a Hero Quest kind of way: you gain experience points for completing missions and killing Genestealers, and leveling up allows access to new abilities, weapons, and equipment. 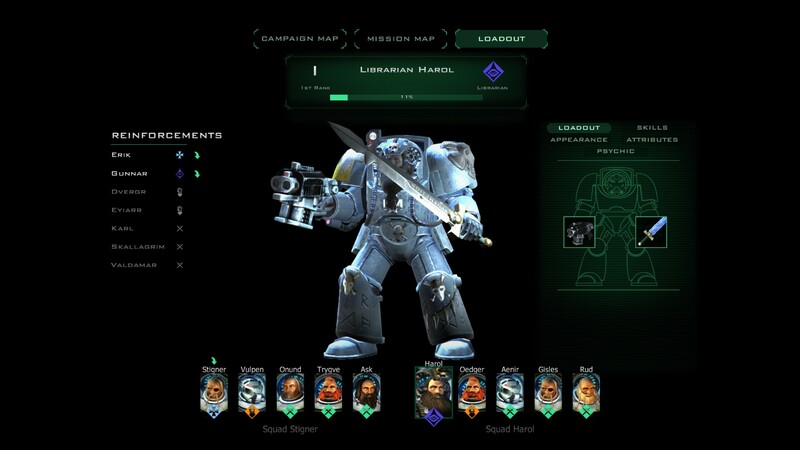 It does help to have different kinds of Terminator – melee specialists, ranged specialists, Heavy units which can carry flamers (required to complete certain missions), Leader characters of the company Standards, and psychic Librarians – particularly in the later missions, although most of the skills and load-outs ultimately only affect stats and not the gameplay. Of note as well is the permadeath mechanic: you have access to a pool of units thatcan very surprisingly and very quickly die, either through lack of care, being flanked, or just having the worst luck possible. Sadly, our review copy included many glitches and placeholder objects that were planned to be fixed at the last minute. A tutorial was created then subsequently taken out. There are still several animation glitches where Terminators freeze in place once killed, as well as unfortunate optimisation problems which cause the game to stutter when more than four Terminators are on the map at a time. This may be fixed in a day one patch, given how diligent Full Control have been with large updates during our review (at least five in the three days leading to release), but a few hours before release it still has broken doors and icons appearing on top of each other. I really wanted to like Space Hulk: Ascension. Survival Horror, turn-based games are rare, and it certainly is no embarrassment to the Warhammer 40,000 franchise. However, there are technical and pacing issues which make it difficult to justify the £23 asking price on launch, especially with X-COM Enemy Unknown and Xenonauts being cheaper, more robust, more open, and, arguably, tenser. I will keep my eye on updates to see if these problems are the symptoms of a rushed launch or not. Right now, however, there is more corruption than ascension in the game.